At this point, do I really need to put a disclaimer on my reviews? Yeah, I probably do and I haven't been doing that lately. 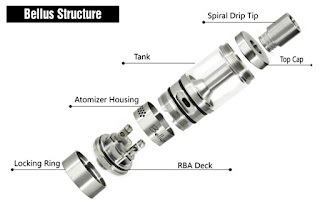 For the record, then, this is a Rebuildable Tank Atomizer that I purchased because I wanted it and I review the things that I purchase. My desire for this tank, and the money I spent on it, will, in no way, skew the review. The Bellus by UD (Youde) is a rebuildable tank atomizer (RTA) featuring a direct-to-coil airflow system, lots of airflow adjustment, a two post, two hole (no Velocity deck here) deck, a unique deck installation arrangement, and top filling. It will hold around 5 ml of e-liquid. In the plastic case, you get the tank, a spare glass stuffed with a rolled up piece of cotton, and a packet of o-rings. The tank comes with clear o-rings installed, and the spares are red or blue. The back of the packaging is covered by a diagram, usage instructions, warnings, and certification seals. Not a bad piece of kit for under $30 for an authentic tank. I paid $23 at FastTech.com, and I've seen it for less and in the US since. 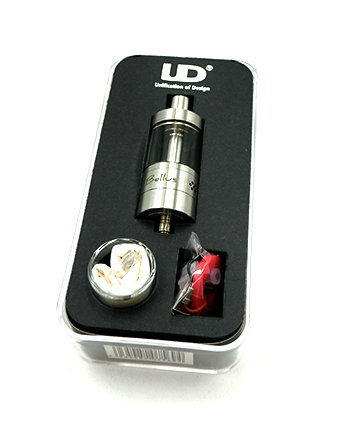 From the top down, there is a short, rifled, stainless steel, wide-bore drip tip inserted in the top cap. This tip is standard 510 and most other drip tips will fit fine. 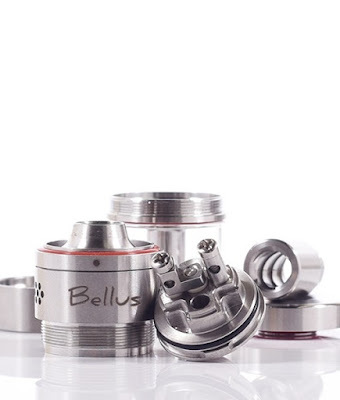 The top cap is a two piece affair with a threaded top top cap, and a shallow funnel bottom top cap. That really doesn't make sense, but that's the way it is. Beneath that is the glass sealed in with an o-ring and sandwiched between the bottom top cap and the bottom of the chimney. On the exterior of the bottom of the chimney is a small laser engraved dot. Then there is a wide band with 16 1.2 mm holes on either side for a total of 32 small air holes. On one side of the band, between the banks of air holes, is the logo engraving. On the other side is a large O. Centering the large O or the logo with the small dot on the exterior of the chimney base indicates wide open airflow. Then there is a retaining ring that holds on the build deck. The build deck does not screw in. It does not screw on. It is inserted and aligned using two notches in the bottom of the airflow collar's interior ring and two tabs on the deck's base. There is also an O0ring on the bottom of the build deck to prevent leakage to the retaining ring. The retaining ring then holds the deck in place. There are no airflow holes in the deck, although there is one hole that looks like it might be for air, it is not. The 510, with an adjustable center pin, is attached to the deck. The tank, when all assembled, is kinda squat looking. It is just 45.5 mm tall (not including 510 threads or drip tip). Not in a bad way, though. It is small for a tank that holds as much e-liquid as it does. It's also just 22 mm in diameter. 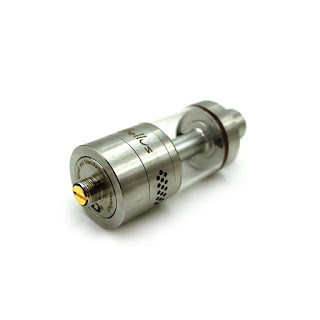 Compare this to the Kanger Subtank Mini which is 9 mm taller and holds 0.5 ml less e-liquid. Building on the deck is easy. The post holes are large enough to support most wires up to 22 gauge. Wrap your coil, insert it into one side and bend the legs back to temporarily position the coil while the second coil is inserted. Additionally, you can build this with a single coil by using the supplied isolator. The isolator fits into the mock air hole on one side of the deck blocking air and e-liquid to that side of the deck. Once the coils are inserted, the Phillips head screws are tightened, and the coils can be given a final tweak. Where building is easy, wicking is not. At least not at first. The e-liquid channels are stepped with a shallower divot all the way to the base and a wider divot at the top, nearer the coils. To properly wick this tank, the wick needs to be set in the wider section at the top and left out of the shallower channel below. Getting wick into the shallower channel leads to massive flooding and leaking out of the air holes on the side. Once set up properly, I have been able to chain vape with reasonably long pulls (two to three seconds) and no dry hits. Let me repeat - Once set up properly. Before I got to this point, I must have leaked around 5 ml of e-liquid out the air holes. The wicking on this tank is probably the trickiest I've ever come across. Once the deck is built and wicked it can be inserted into the tank section and secured with the threaded retaining ring. Where this seems like a good idea - and it is, really, as it ensures that the coils are lined up with the airflow ports and e-liquid ports every time - it makes for another step I am having trouble getting used to. I am used to building, wicking, and then inverting the mod I've used to fire and tweak the coils and screwing the tank back on. With this set up, the base has to be removed from the mod and inserted into the deck and then secured. The base cannot be left on the mod. Not a big deal, but forgetting this can lead to a lap-full of e-liquid. Filling the tank is also a bit tricky. It is top fill, and there are two ports (one for e-liquid to go in and another for air to come out), but they are smallish. They are large enough for a fine point squeeze bottle, but just a little smaller than a dropper tip. Additionally, those fill ports are situated on opposite sides of a downward sloping funnel. At the center of that funnel there is a small lip before any stray e-liquid goes down the chimney and to your coils. I generally ed up having to put a dropper full into the tank and then use the dropper to vacuum up anything that missed before getting another dropper-full of e-liquid and starting the process over. If I were to destroy this tank (and the thought has crossed my mind) would I replace it? Are you kidding? For $23 for an authentic RTA, I would most certainly keep it around or replace it if I broke it. Yes. The flavor is good and the vapor is fantastic. Finish - 9/10 - The only place I have any issues is with the threads on the top top cap. I can't seem to get that threaded on fast enough and I wonder if this doesn't contribute to the leaks I have been having. The slotted and tabbed base fits perfectly, the retaining ring goes on with buttery smoothness, the post holes and Phillips head screws work perfectly, and the airflow control moves smoothly but not freely. Function - 8/10 - The wicking is fiddly and the extra step of removing the built base to install it is a necessary evil. Those niggles aside, it vapes great! Final - 9/10 - A grade! The vapor production and flavor from this tank are good enough for me to keep it in a solid rotation even with the annoying wicking and retaining ring installation method.